Nintendo has officially posted its financial results for the last fiscal year. The entire document can be read, in PDF form, directly on Nintendo's Japanese site. Fear not, it's in English. 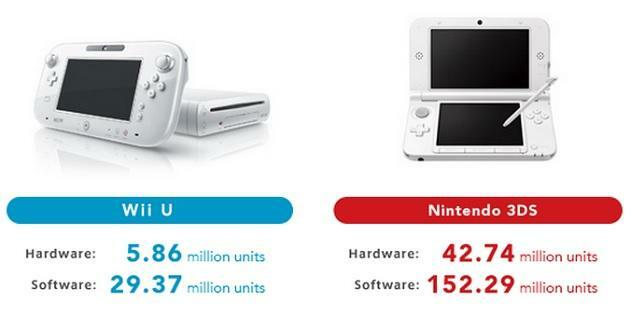 There's no denying that the Wii U has not been a good machine for Nintendo's sales. The console has officially sold only 5.86 million units globally since launch. It's only sold 29.37 million pieces of software, to boot. Now, the good news in that mix is that the banner titles released towards the end of 2013 have been doing well. The Legend of Zelda: The Wind Waker HD, Super Mario 3D World and Wii Party U (of all things) each broke one million sold. If you're suggesting this is where Nintendo dies, hold on for a moment. The financial documents indicate that the company has nearly $15 billion in its proverbial warchest. The Wii U could bomb even harder and Nintendo would be fine. The good sales news belongs to the Nintendo 3DS and, believe it, the 2DS. The 2DS has sold more than 2.1 million units since launch. As of the end of December, total sales for all 3DS SKUs exceeded 42 million. It's selling very well. On top of that, Nintendo 3DS software is performing well, too. Pokemon X and Y moved more than 11.6 million, Animal Crossing: New Leaf sold 3.52 million, and The Legend of Zelda: A Link Between Worlds sold 2.18 million. Nintendo is set to reveal their upcoming business plan within the day. We'll share the details of that briefing as they come.